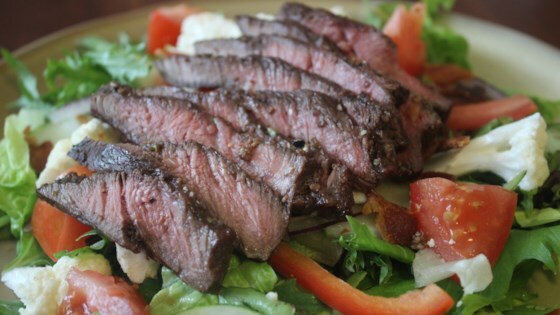 "My special recipe combines balsamic vinegar, olive oil, and spices creating a simple, delicious marinade. My technique yields the most tender and juicy steak." Place steaks, balsamic vinegar, olive oil, green onions, garlic, soy sauce, thyme, mustard, and black pepper in an extra large resealable plastic bag, squeeze out excess air, and seal the bag. Knead the bag with your hands to distribute ingredients evenly and completely coat the steaks. Marinate in the refrigerator for 1 hour. Preheat grill for medium-high heat and lightly oil the grate. Remove steaks from refrigerator and let sit at room temperature for 10 minutes. Remove steaks from bag and discard marinade. Cook steaks on the preheated grill until they start to firm and are reddish-pink and juicy in the center, 6 to 7 minutes per side. An instant-read thermometer inserted into the center should read 130 degrees F (54 degrees C). Remove steaks to a plate and let rest for 5 minutes before slicing. This was fine, but nothing special. I marinated overnight and the meat was nicely seasoned. I followed the recipe minus the time and the meat was tender and some of the best Ive had. Everyone loved them!